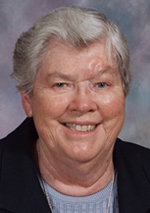 Sister Margaret Appell, O.S.F. (formerly Sister St. Margaret), died Jan. 4 in Assisi House, Aston. She was 87 and had been a professed member of the Sisters of St. Francis of Philadelphia for 67 years. Sister Margaret (born Mary Louise Appell) was born in Baltimore, Md., where she was a member of St. Bernard Parish and a graduate of the Catholic High School of Baltimore. She entered the congregation in 1949 and professed her first vows in 1952. Sister Margaret earned a B.S. in education from Villanova University and an M.A. in education administration from the Catholic University of America in Washington, D.C. She ministered primarily in elementary education. She ministered for 34 years in schools of the Diocese of Trenton, including St. Rose of Lima School in Freehold and Holy Angels School in Trenton. She served as principal at Blessed Sacrament School and Immaculate Conception School, both in Trenton, and as assistant principal and technology coordinator at St. Mary of the Lakes School in Medford. From 1983-1989 she served on the provincial council for the Sisters of St. Francis’ St. Anthony Province, at that time based in Trenton, and served as provincial coordinator of education. During Sister Margaret’s 11 years of ministry in the Diocese of Camden, she served as both teacher and principal at St. Nicholas School in Egg Harbor. Sister Margaret also ministered for 10 years in the Diocese of Harrisburg and for a short time in the Diocese of Wilmington. She also served for 12 years in the Archdiocese of Philadelphia. She worked in the education department of Neumann University and later served there as a volunteer. In 2013 she moved to Assisi House, the congregation’s retirement residence in Aston, where she served in prayer and hospitality ministry until her death. The funeral Mass was celebrated Jan. 9 at Assisi House. Burial was in Our Lady of Angels Cemetery in Aston. Sister Margaret is survived by a nephew, nieces, and by her Franciscan family. Donations in her name can be made to the Sisters of St. Francis Foundation, 609 S. Convent Road, Aston, PA 19014.